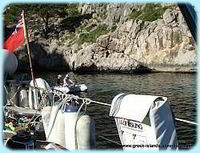 Selkie Dancer is an Oyster 406 yacht, owned by our good friends Andy and Jinti who are on a Mediterranean Odyssey. We are the erstwhile landlubbers. They have sailed Selkie Dancer from their homeland of Scotland in a general southerly direction, through the Bay of Biscay (brave folks) and into the Mediterranean. They are keeping a log of their trip on their website and it makes a cracking good read, especially for us armchair adventurers. 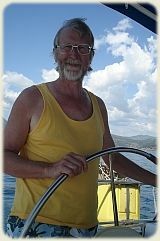 Some of our Greek adventures have been sailing and after our first trip as complete beginners we thought that some sort of sailing experience would be a good thing to help us become less landlubbery. Andy and Jinti kindly invited us to join them on a trip around Majorca (which is closer to the Greek Islands than where I sitting at the moment) and even said that they would teach us a bit about sailing. A free holiday and sailing lessons to boot, not an opportunity to miss. We caught an EasyJet flight from Bristol to Palma and thence by taxi and bus across the island to Puerto Pollença in the North East of the island (That was an adventure in itself but that will have to wait for a new website). Andy and Jinti were waiting at the bus stop on the harbour and while the girls went shopping, Andy and I loaded up the tender with our luggage (first tip - travel light when sailing) and sped across to Selkie Dancer to unload. Then back to pick up the shore party with our provisions. Once we were all back on board we (the landlubbers) were shown around. What a beautiful yacht? Over the next few days we had a great time relaxing, swimming and especially learning a lot about sailing and living on a yacht. The weather was a perfect combination of sun, wind (but not too much) and the occasional calm bit. Let Mrs. S introduce them. There was me as well of course, behind the camera. I was novice seaman learning the ropes as it were. Emily - She did quite a bit of work helping move Selkie Dancer along by turning the propeller. George - He allowed us to have a relaxing lunch by making sure we were going in the right direction. He and Emily worked together a lot. Scarlett - Unfortunately it was not windy enough for her to demonstrate her prowess while we were aboard. She could control Selkie Dancer entirely by the wind without any help from the other two. Or us. I am sure there were lots of others helping us along but those are the main stars. 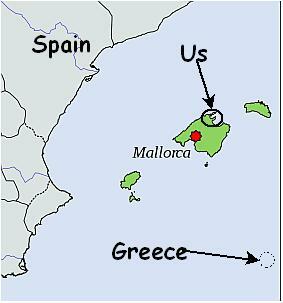 Our trip took us down the East coast of Majorca and apart from a brief raid ashore to search for something to barbecue we did not put in to land until our destination at Porto Christo. Wonderful! Setting Off Check list - helps ensure that everything is ship shape before sailing. Andy allowed us to plagiarise his list for our next flotilla holiday. See our version. Heave to - I have always wondered what this meant. One day Andy told me to change tack, but halfway through he then said turn the helm back the other way ... and we stopped! It still seems like magic to me but we did it a lot on our own later, sometimes accidentally. Keep drinks and biscuits handy in the cockpit - It is surprisingly strenuous at the helm and you can get a bit peckish and thirsty. Anchoring - We are now confident that we can anchor up in a bay and have some lunch rather than drift around as we did before. Beware jelly fish - the small ones are the worst and they seem to hunt in packs. The trip was only 4 days but it was so mentally relaxing (not physically I hasten to add) that it seemed much longer. We took the inevitable photos and here are a few of the adventure. One thing we were amazed at was the cooking that could be done on board. as you may have seen in the video, it was Mrs.S' birthday and Jinti baked a cake for her! How do you do that in a yacht's galley? Breakfast was cereal, grapefruit, toast, Marmite. In fact all the stuff you would normally have. The difference was that we ate it in the glorious Mediterranean morning sun in Selkie Dancer's cockpit. One very useful skill that we learnt was the technique for anchoring in a bay in order to have lunch. This was something that we had great trouble with on our first sailing adventure. The most obvious lesson is to anchor in sand if poss and not too deep. I don't know why we didn't think of it ourselves! Oh! and put out a length of anchor chain 3 - 4 times the depth of water (Hence no deep anchorage). It helps to tell the helmsman (or woman in our case) what is going on. Navigation is very high tech on Selkie Dancer. This contrasts somewhat with with the line of sight, map and compass method used on our flotilla adventure. So no practice on dead reckoning and use of sextant then. there was plenty of opportunity for inflatable dinghy rowing practice. Talking of dinghies that was another useful tip we got. We found that flating (?? I invented that word) and deflating the dinghy every day was a bit of a chore. 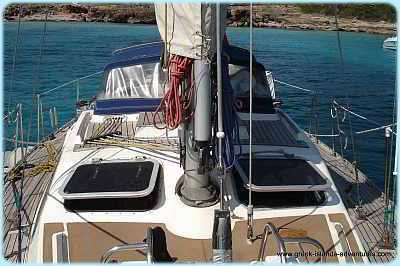 Why not just heave it on board and tie it up on the foredeck? Just to show that I really did some sailing sorts of activities, here are some pics of me honing my skills. Don't forget to lock the sheet afterwards otherwise it is all to no avail. The great thing about sailing is that every individual piece of rope has a specific name and task. There is then no ambiguity when shouting at the crew to pull something quick! Hence a painter does not redecorate your yacht and neither do you sleep on sheets. That is a bit tricky for us landlubbers. Shouldn't I face the other way? At the end of the day we exchanged old sea yarns helped by a tot of grog. Well ... a glass of wine anyway. To find out more and how it should really be done, I highly recommend that you read about the adventures of Andy, Jinti and Selkie Dancer on their brilliant website. You may even see us mentioned there. Will we be invited again? Hope so.